This is the second part of Max's Hair Conversion Project for Boys. 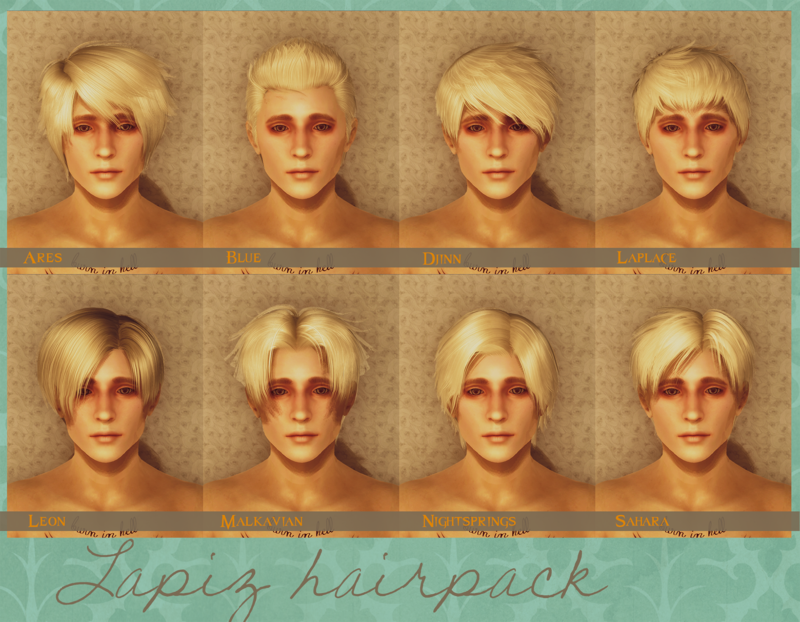 I have converted to Oblivion 8 gorgeous male hairs by Lapiz Lazuli, originally made for the Sims2. So far these hairs were converted in total- Ares, Blue, Djinn, Laplace, Leon, Malkavian, Nightsprings, Sahara. Authors: Lapiz Lazuli + Maxim K.
The boys enjoy wearing the new hairs more than anything else in the world. There's a lot of Gill in these pictures, in his favourite Leon do. He's the model for the hair chart, too. 2013.10.22 - Sahara hair's alpha fixed. Redownload, if you care. And yes, there is another hairdo by Lapiz that was converted since Lapiz Hair pack was up here, the beautiful Zombrex hair, but I won't share this one in the near future. 2014.06.21 - The hair installation manual added, the hair chart remade. Head06 + races by Max and Flan. Them races require Robert's male body replacer v.5.2. The hairs were conformulated to fit Robert's heads06. Should work with any other head too. Room207 - alpha fix for the Malkavian hair and basically teaching me how to do this. thanks to my baby Dustin for his love and loads of inspiration. thanks to Lapiz, Room207, and to all our fans. Lapiz hairpack stays here, as Lapiz only gave permissions to me to upload these hairs in my blog, that is maxheartflan.com. Please do not redistribute the hairs in your mods. You have to add the hairs in your game yourself via Oblivion Construction Set, or you can use our races listed below. this is a proud day for you and me, because of the lack of cute hairs for males in oblivion. max did such a great job converting these, reshaping for the oblivion heads. i hope you all appreciate these as much as i do. Thanks guys! There will be more hairs uploaded soon. yes peter you are so right! i haven't even finished the lock reorder on a single hair yet, it's too complicated for me, so i have deep respect for you and max for mastering this technique.